قهری, سامان, محبی, بهبود, پیزی, آنتونیو, میرشکرایی, احمد, منصوری, حمید رضا. (1396). استفاده از چسب آرد سویا- تانن در ساخت تخته خرده چوب (شرایط خشک). مجله صنایع چوب و کاغذ ایران, 8(1), 131-143. سامان قهری; بهبود محبی; آنتونیو پیزی; احمد میرشکرایی; حمید رضا منصوری. "استفاده از چسب آرد سویا- تانن در ساخت تخته خرده چوب (شرایط خشک)". مجله صنایع چوب و کاغذ ایران, 8, 1, 1396, 131-143. قهری, سامان, محبی, بهبود, پیزی, آنتونیو, میرشکرایی, احمد, منصوری, حمید رضا. (1396). 'استفاده از چسب آرد سویا- تانن در ساخت تخته خرده چوب (شرایط خشک)', مجله صنایع چوب و کاغذ ایران, 8(1), pp. 131-143. قهری, سامان, محبی, بهبود, پیزی, آنتونیو, میرشکرایی, احمد, منصوری, حمید رضا. استفاده از چسب آرد سویا- تانن در ساخت تخته خرده چوب (شرایط خشک). مجله صنایع چوب و کاغذ ایران, 1396; 8(1): 131-143. در این پژوهش چسب آرد سویا- تانن بطور موفقیت آمیزی در ساخت تخته خرده چوب مورد استفاد قرار گرفت. برای اصلاح ویژگی های چسب سویا از دو نوع تانن متفاوت میموزا (تانن متراکم) و شاه بلوط (هیدرولیز شدنی) استفاده شد. برای این منظور هریک از تانن-ها در مقادیر 5، 10 و 15 درصد بر اساس وزن خشک آرد سویا به چسب سویا افزوده شد و از تسریع کننده گلی‌اکسال برای تحریک واکنش پذیری تانن ها استفاده شد. چسب سویا-تانن آماده شده در ساخته تخته خرده چوب‌هایی با ابعاد 14‌×300‌×350 میلیمتر مکعب با دانسیته ظاهری 7/0 گرم بر سانتی مترمکعب استفاده شد. نتایج آزمون گرانروی نشان داد که افزودن هریک از تانن ها سبب کاهش محسوس گرانروی چسب سویا می‌شود. نتایج آزمون ترمومکانیکی چسب ها نیز نشان داند که تانن شاه بلوط در ترکیب چسب سویای مورد استفاده در این تحقیق عملکرد بهتری در ارتقاء رفتار چسبی چسب سویا داشت. همچنین کاربرد تانن ها در ترکیب چسب سویا سبب افزایش چسبندگی داخلی و خواص خمشی تخته خرده چوب‌های ساخته شده گردید. Ghahri, S., Mohebby, B., Mirshokraie, S.A.and Mansouri H.R., 2016.The effect of soy-flour mesh size and its adhesive acidity changes on shear strength of plywood. 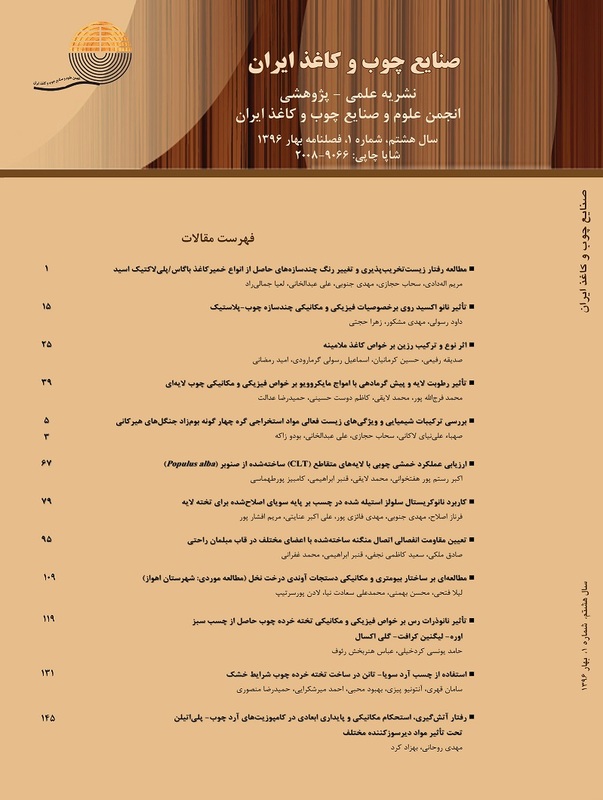 Iranian Journal of Wood and Paper Industries, Available Online from 04 April. (In Persian). Huang, J. and Li, K., 2008. A new soy flour-based adhesive for making interior type II plywood. Journal of the American Oil Chemists Society, 85: 63-70. Li, X., Li, Y., Zhong, Z., Wang, D., Ratto, J.A., Sheng, K. and Sun, X.S., 2009. Mechanical and water soaking properties of medium density fiberboard with wood fiber and soybean protein adhesive. Bioresource Technology 100 (14): 3556–3562. Ciannamea, E.M., Stefani, P.M. and Ruseckaite R.A., 2010. Medium-density particleboards from modified rice husks and soybean proteinconcentrate-based adhesives. Bioresource Technology, 101: 818–825. Hettiarachchy, N.S., Kalapathy, U. and Myers, D.J., 1995. Alkali-Modified soy protein with improved adhesive and hydrophobic properties. Journal of the American Oil Chemists Society, 72(12): 1461-1464. Allen, A.J., Marcink, J.J., Wagler, T.A. and Sosnowick A.J., 2010. Investigations of the molecularinteractions of soy-based adhesives. Forest Prouct Journal, 60 (6):534–540. Zhu, D. and Damodaran, S., 2014. Chemical phosphorylation improves the moisture resistance of soy flour-based wood adhesive. Journal of Applied Polymer Science, DOI: 10.1002/APP.40451. Steele, P.H., Kreibich, R.E., Steynberg, P.J.and Hemingway R.W., 1998. Finger jointing green southern yellow pine with a soy-based adhesive. Adhesive Age, 50 (1): 49–54. Kazemi Najafi, S. and Doost Hoseini, K., 2000. The use of Gall flour as the filler of phenol-formaldehyde resin in plywood manufacturing. Iranian journal of natural resuarces, 53 (2): 155-164. (In Persian). Torkaman, j., Doost Hosseini, K. and Mirshokraie, S.A., 2003. Spectrophotometrical study on bark’s tannin of Alder and Oak trees. Iranian journal of natural resuarces, 56 ( 3): 271-279. (In Persian). Pizzi, A., 2013. Bio adhesives for wood and fibres: A Critical Review, Reviews of Adhesion and Adhesives, 1 (1): 88-113. Siebert, K.J., Troukhanova, N.V. and Lynn, P.Y., 1996.Nature of polyphenol-protein interactions. Journal of Agriculter and Food Chemistry, 44, 80-85. Rawel, H.M., Czajka, D., Rohn, S. and Kroll, J., 2002. Interactions of different phenolic acids and flavonoids with soyproteins. International Journal of Biological Macromolecules, 30 (3): 137-150. Guerra-Hernandez, E., Corzo, N. and Garcia-Villanova, B., 1999. Maillard reaction evaluation by furosinedetermination during infant cereal processing. Journal of Cereal Science, 29: 171–176. Muoki, P.N., de Kocka, H.L. and Emmambuxa, M.N., 2012. Effect of soy flour addition and heat-processing method on nutritional quality and consumer acceptability of cassava complementary porridges. Journal of the Science of Food and Agriculture, 92: 1771–1779. Oh, H., Hoff J.E., Armstrong, G.S. and Haff L.A., 1980. Hydrophobic interaction in tannin-protein complexes. Journal of Agricultural and Food Chemistry, 28: 394-398. Yin, B.S., Deglise, X. and Masson, D., 1995. Thermomechanical analysis of wood/aminoplastic adhesives joints cross-linking - UF, MUF, PMUF. Holzforschung, 49, 575-580. Ma, w., Guo, A., Zhang, Y., Wang, H., Liu, Y. and Li, H., 2014. A review on astringency and bitterness perception of tannins in wine. Trends in Food Science &Technology, 40: 1-14. Asquith, T.N. and Butler, L.G., 1986. Interactions of condensed tannins with selected proteins. Phytochemistry, 25 (7): 1591-1593. Jahanshahi, S., Pizzi, A., Abdulkhani, A. and Shakeri, A., 2016. Analysis and testing of bisphenol a—free bio-based tannin epoxy-acrylic adhesives. Polymers, 8, 143; doi: 10.3390. Spina, S., Zhou, X., Segovia, C., Pizzi, A., Romagnoli, M., Giovando, S., Pasch, H., Rode, K. and Delmotte L., 2013. Phenolic resin adhesives based on chestnut (Castanea sativa) hydrolysable tannins. Journal of Adhesion Science and Technology, 27: 2103–2111. Sealy-Fisher, V.J. and Pizzi, A., 1992. Increased pine tannins extraction and wood adhesives developmentby phlobaphenes minimization. Holz als Roh- und Werkstoff, 50: 212 220. Frazier, R.A., Papadopoulou, A., mueller-harvey I., Kissoon, D. and Green R.J., 2003.Probing protein-tannin interactions by isothermal titration microcalorimetry. Journal of Agricultural and Food Chemistry, 51: 5189-5195. Cheng, E., Suna, X. and, Greggory, K.S,. 2004. Adhesive properties of modified soybean flour in wheat straw particleboard. Composite part A, 35, 297–302. Frihart, C.R., Birkeland, M.J., Allen, A.J. and Wescott, J.M., 2010. Soy adhesives that can form durable bonds for plywood laminated wood flooring, and particleboard. Proceedings of the International Convention of Society of Wood Science and Technology and United Nations Economic Commission for Europe – Timber Committee October 11-14, Geneva, Switzerland, p 1-12. Standard Test Method for Determination of Percent Nonvolatile Content of Liquid Phenolic Resins Used for Wood Laminating. Annual Book of ASTM Standard, D 4426, 1993. Standard test method for density and relative density (specific gravity) of liquids by Bingham pycnometer. Annual Book of ASTM Standard, D 1217-93, 1998. European Standard EN 326-1. 1993. Wood based panels, Sampling, cutting and inspection. Sampling and cutting of test pieces and expression of test results. European Standard EN 310. 1996. Wood based panels, determination of modulus of elasticity in bending and bending strength. European Standardization Committee, Brussell. European Standard EN 319. 1996. Wood based panels, determination of tensile strength perpendicular to plane of the board. European Standardization Committee, Brussell. European Standard EN 317. 1993. Particleboard-specification. Particleboards and fibreboards. Determination of swelling in thickness after immersion in water. European committee for standardization Brussels.